I have said it before, but it is worth saying again, Young Fathers are by far the best live act on the go just now. They are growing their following whilst barely changing the formula that they started out with: three Edinburgh men singing, contorting, crooning and shouting over a droning electronic background and vigorous live drumming. 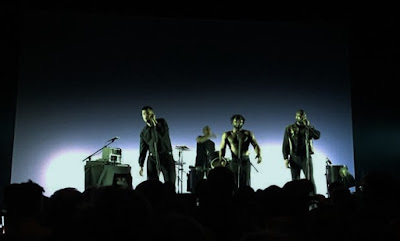 Live they give the impression of barely contained rage, and building pressure with little more than a dour Scottish sneer on show, the only visible release onstage is when Kayus Bankole convulses in an intermittent blur of flailing arms and legs. 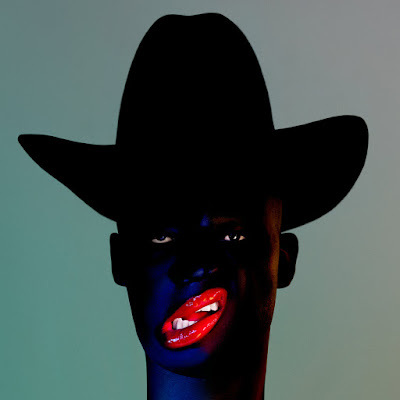 With the release of their latest album, Cocoa Sugar, they continue to produce a string of strong songs, which are uniquely "Young Fathers" when you hear them. Their very presence is a statement, but they don't beat you around the head with it, it's the nusic that assaults you. When it was announced that they were playing the Glasgow Barrowlands, tickets sold out within days. The question was whether their intense stage persona, which doesn't usually involve crowd pleasing "HALLO GLASGOOOOOW" shout-outs, would manage to lift the ballroom crowd. Support act WWWater were appropriately uplifting, with hints of Grace Jones and analogue synths among the increasingly abstract singing of Belgian Charlotte Adigéry. The crowd were showing signs of being in the mood for tonight's gig with the enthusiastic response she garnered. Young Fathers when they came on stage could not get started until a cheering, stamping, expectant crowd had quietened down sufficiently to let them get going. Any doubts that they would not manage to take this whole room with them blown away in the first few seconds. With Graham 'G' Hastings, Kayus Bankole and Alloysious Massaquoi out front, largely silhouetted for the night against a white screen, they came together and drifted apart through all the songs, their voices merging and splitting from years of playing together. Tracks from the new album dominated the setlist (Tremolo, Toy and In My View stand out tracks tonight) but there were outings for plenty of stuff from their earlier output merged seamlessly into it. 'G' almost broke into a smile at a couple of points as he tried to give us a few words, but ultimately stuck to the music. Loud, angry, energetic and something worth listening to. The crowd were grinning, cheering, singing along and baying for more - a reminder of how good it can feel to be part of a big Glasgow crowd when they are in the mood, whether at a football match or a concert. Best gig I've been to in a long time? Probably.